Computational approaches to identify promoters and cis-regulatory elements in plant genomes. Rombauts, S., Florquin, K., Lescot, M., Marchal, K., Rouzé, P., Van de Peer, Y. The identification of promoters and their regulatory elements is one of the major challenges in bioinformatics and integrates comparative, structural, and functional genomics. Many different approaches have been developed to detect conserved motifs in a set of genes that are either coregulated or orthologous. However, although recent approaches seem promising, in general, unambiguous identification of regulatory elements is not straightforward. The delineation of promoters is even harder, due to its complex nature, and in silico promoter prediction is still in its infancy. Here, we review the different approaches that have been developed for identifying promoters and their regulatory elements. We discuss the detection of cis-acting regulatory elements using word-counting or probabilistic methods (so-called "search by signal" methods) and the delineation of promoters by considering both sequence content and structural features ("search by content" methods). As an example of search by content, we explored in greater detail the association of promoters with CpG islands. However, due to differences in sequence content, the parameters used to detect CpG islands in humans and other vertebrates cannot be used for plants. 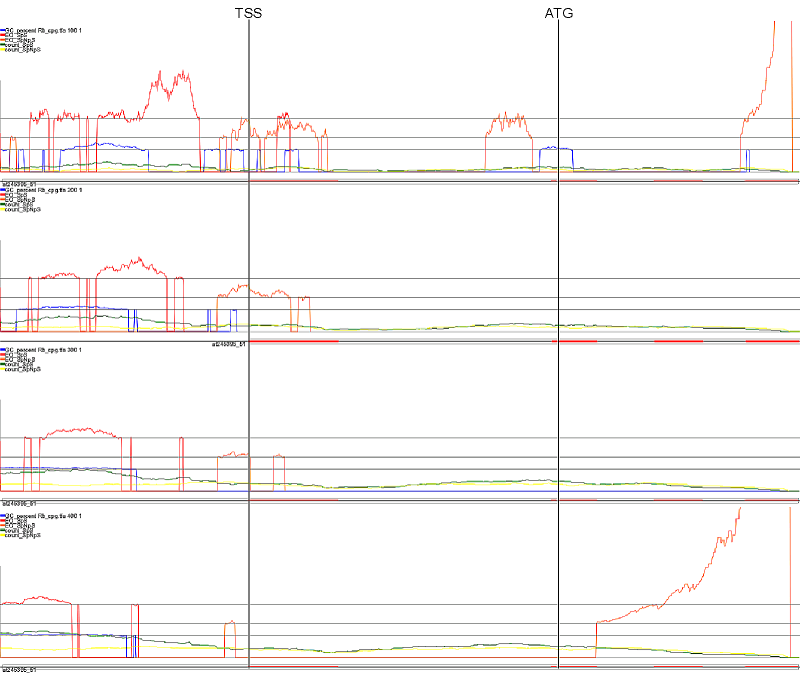 Therefore, a preliminary attempt was made to define parameters that could possibly define CpG and CpNpG islands in Arabidopsis, by exploring the compositional landscape around the transcriptional start site. To this end, a data set of more than 5,000 gene sequences was built, including the promoter region, the 5'-untranslated region, and the first introns and coding exons. Preliminary analysis shows that promoter location based on the detection of potential CpG/CpNpG islands in the Arabidopsis genome is not straightforward. Nevertheless, because the landscape of CpG/CpNpG islands differs considerably between promoters and introns on the one side and exons (whether coding or not) on the other, more sophisticated approaches can probably be developed for the successful detection of "putative" CpG and CpNpG islands in plants. Preliminary analysis shows that promoter location based on the detection of potential CpG/CpNpG islands in the Arabidopsis genome is not straightforward. Nevertheless, because the landscape of CpG/ CpNpG islands differs considerably between promoters and introns on the one side and exons (whether coding or not) on the other, more sophisticated approaches can probably be developed for the successful detection of "putative" CpG and CpNpG islands in plants.